Apotheosis City is the primary zone for Ship of Heroes at launch. Its the first cylindrical floor of the FHS Justice, and is currently the first and primary zone players will visit. 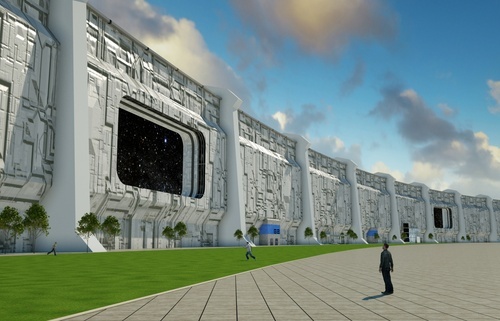 The wall surrounding the city is the interior of the hull of the ship. All around, huge ports provide a view outside. Each port has a slightly different view, since they're looking out at different parts of space. The city is roughly three square miles, and features a futuristic, planned design centered around Heroic Plaza and the iconic Arch. Many tall skyscraper buildings dot the skyline. Two enormous statues of historical heroes locked in battle straddle the main plaza, and a large lake dominates the center of the city. An iconic bridge spans the lake and warehouses line it shores. 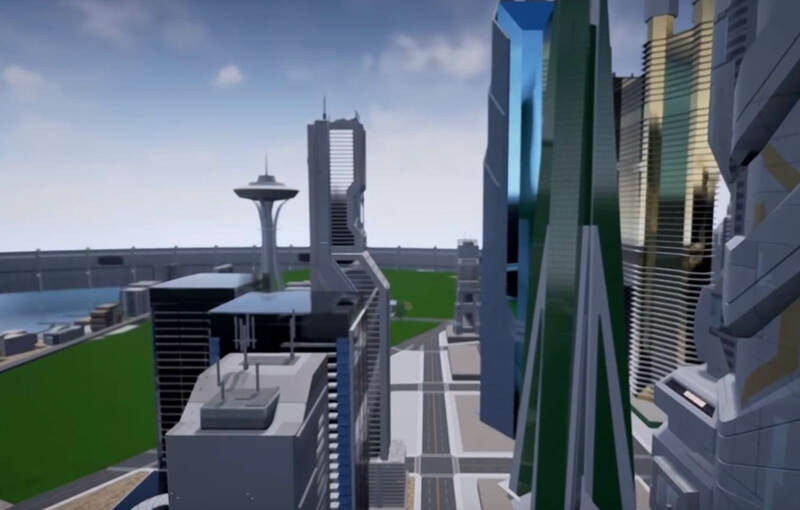 Elevated walkways and hanging landing pads characterize the city as home to flying heroes. 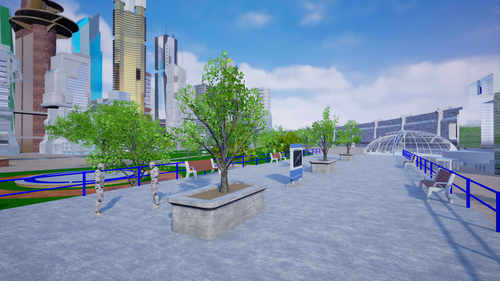 The explorable areas are shown on the map: Heroic Plaza, the Shopping Distict, Housing area, Hotel District, Science Park, Forest Park, the central landmark: Arch Plaza, the Waterfront, the Warehouse Area, Lake Fortitude and the Hazard Zone. A simulated weather and day/night cycles provide an earthly environment for the ship's passengers. The far side of the lake features a Hazard Zone which will be an unsecured area where heroes can fight mobs. The city hides a few popular social gathering hotspots, such as the famous Starboard Lounge, where heroes can grab a stiff drink and a quick bite to eat. 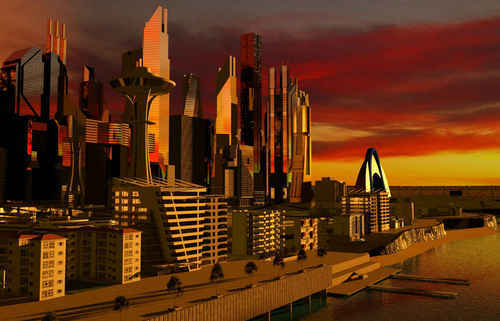 Apotheosis City was the first level completed during construction back on Earth. 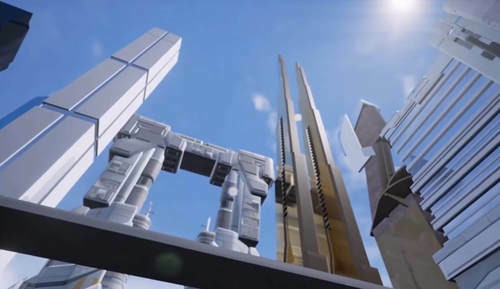 The designers were trying to make the best possible small city within the parameters of the ship size and design, so they called it Apotheosis City. [This] explains why several of the key landmarks are familiar versions of similar landmarks on Earth. 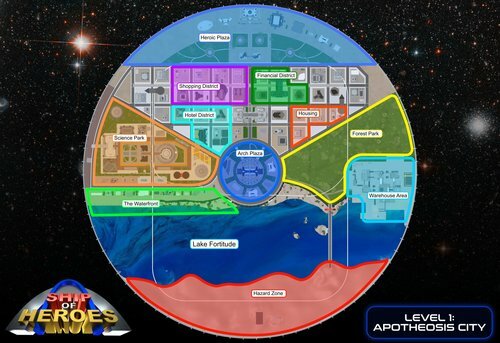 The Official Ship of Heroes Website - Apotheosis City, Revealed!